When you slow most things down it is quite reasonable to expect that you will save a bit of energy, just think of the difference between running and walking or driving your car more slowly. It is the same in your factory or office block with electric motors, slow them down a bit and they use less energy. If the application is a conveyor or a mixer then a ten per cent reduction in the motor’s speed is about a ten per cent reduction in energy. Fans and pumps are different, when you slow centrifugal fans or pumps the energy saving can be spectacular and so therefore is the time it takes to payback your investment. As an example, think of how little effort it takes to spin a small hand held fan to get it going and how much harder it gets as the fan speeds up. This is the same for industrial fans and pumps …. it’s just that the cooling pump in your factory or Air Handling Unit for your office block are normally much bigger, usually oversized and often have a valve or damper to restrict flow. A damper or flow valve saves a bit of energy but nowhere near as much as slowing down the fan or pump. 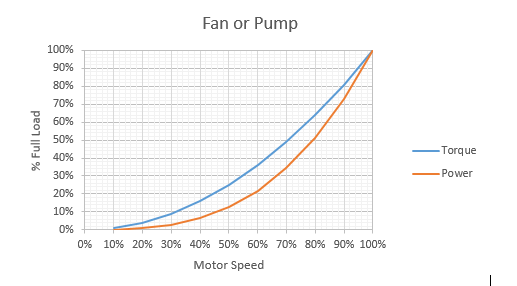 The relationship between the speed and power of a fan or a pump is called the Cube Law and can be built up step by step. 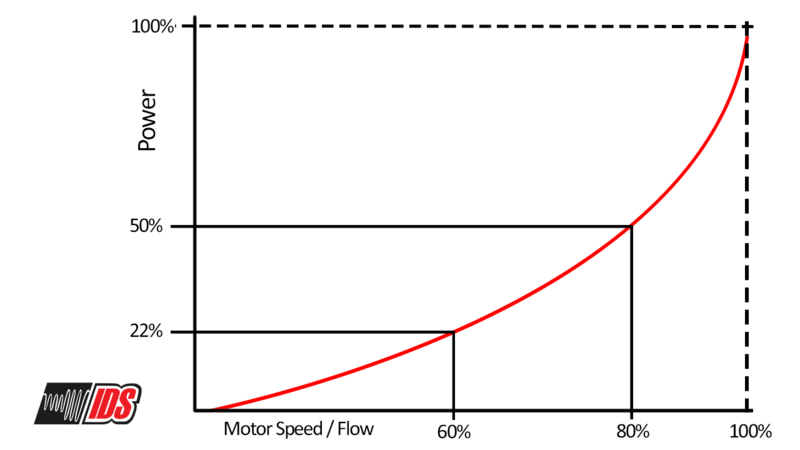 The flow is proportional to the speed: 10% slower = 90% flow. The power is proportional to the speed cubed. Since it is the power that costs the money the graph shows what it look like in practice. 0.8 x 0.8 x 0.8 equals approx. 50% of the power. 0.9 x 0.9 x 0.9 equals approx. 73% of the power. The only thing around to reduce the speed is a Variable Speed Drive as we can’t really ask the power generator to reduce the mains frequency!! Putting this into practice, a 22kW extraction fan running at full load at around 90% efficiency for 8 hours per day for 3 shifts Mon-Fri (4160 hours each year) at 10p per kWh costs £8,231.00 each year to run. If we slowed the fan to 90% speed we would save 27% or £2,222.00 pounds per year – every year. This saving is not far from the price of an ABB 22kW variable speed drive so your investment pays back in around a year – and once again, every year. So what are you waiting for give us a call on 0115 944 1036 or email sales@inverterdrivesystems.com and book an energy efficiency motor audit (link) and let us show you how you can save money across all of your motors.